Barbra and Nicholas Sarkozy. 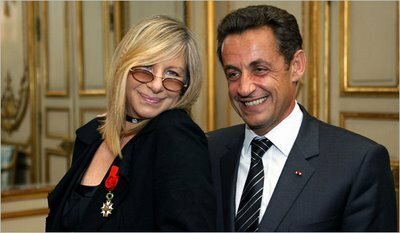 Barbra Streisand poses after being awarded oleh French President Nicolas Sarkozy as Officer of France's Legion d'Honneur order (legion of honnor),. Wallpaper and background images in the Barbra Streisand club tagged: barbra barbra streisand nicholas sarkozy. This Barbra Streisand photo might contain setelan jas untuk bekerja and setelan bisnis.